Happy May the 4th to all my fellow Star Wars sewing nerds! I think today is such a fun day to show off my geeky sewing side. I was so excited when I found this Star Wars knit at Jo-Ann’s back in March. For the longest time, sewists options have been limited to woven cotton fabrics printed with our favorite characters and fandoms. 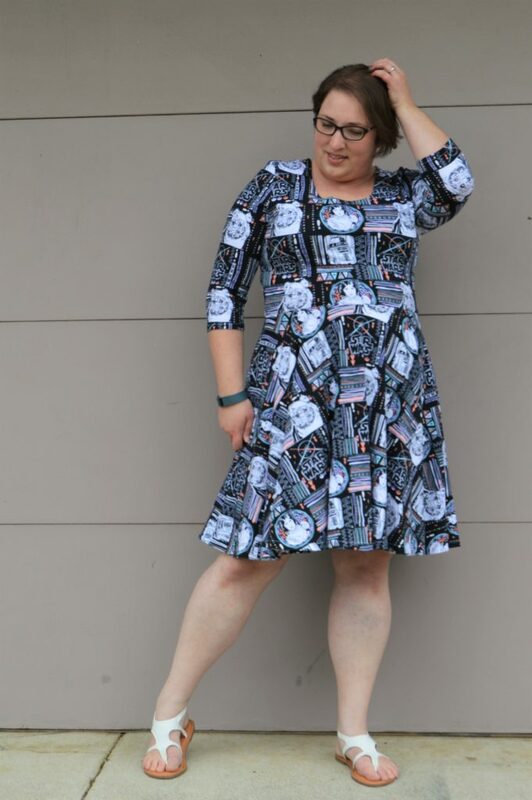 I enjoy sewing woven fun geeky dresses but a geeky knit dress…that is game changing! What’s even better is the print features Princess Leia, R2D2, and Ewoks! I am also excited that I am hosting the Stashbusting Sewalong this month with the theme of sewing inspired by movies/TV/novels. How fitting that this theme was picked for May! Ha, I love it! This is my second version of the recently release Bella Sunshine Designs – Sahara Dress. I still believe it is a really fantastic pattern. For this version, I did choose to make the lower neckline version, which is only an inch lower. That one inch is not a big deal, but it does allow for some other necklace options. I am on the hunt for a big chunky costume piece necklace now. The only change I made to the pattern was in how I cut the skirt. The pattern features a full circle skirt with no seams. I chose to make it a full circle with side seams because of the print. If I had left it as intended the print would have been upside down in the back and right side up in the front. That is not really the look I was going for, so side seams it was and it worked really well. I placed the pattern piece on the fold and added 3/8″ to the side seam for seam allowance. One of my favorite features of this pattern is that back neckline scoop. Gosh, it is just a good flattering back neckline. It is a little bit more revealing than a standard higher back without actually being immodest and showing my bra. I also love that the bodice is fully lined, making it so you have a clean finish. I did choose to topstitch the neckline because, personally, I like that finishing detail but it is not necessary. I think that the lining also helps give the bodice a bit more tummy sucking in shaping too and who doesn’t want that?! I am considering this fabric stash fabric, even though I recently bought it in March. I bought it with no project in mind and knew it when I brought it home I would put it on the shelf with the rest of my stash. I did use all 3 yards that I had bought as well as a half yard of white jersey for the lining that was purchased in 2014. I am pretty pleased that I didn’t let that linger too long and used an even older stash fabric on top of that. Earlier, I mentioned that this pattern features a full circle skirt. Do you know what the benefit of a full circle skirt is? Maximum twirl factor! After working in the show choir industry making dresses that satisfy this twirling need, I am excited to be able to have it in my everyday dresses. It is just plain fun! I am excited to be able to wear this dress this to Gen Con this year and C2E2 next spring. 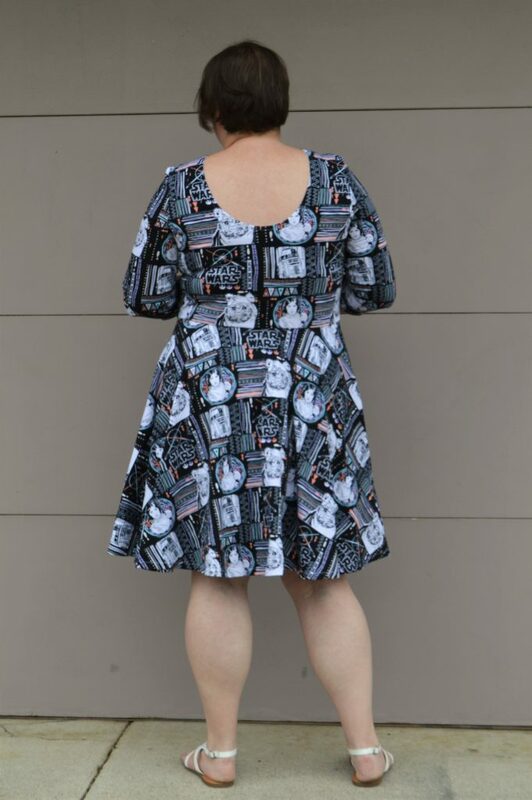 When I wear my geeky printed dresses to Gen Con I tend to get stopped and asked where I got it. I think I may need to get some new business cards printed now. Stay tuned this month for more geeky Star Wars makes for my husband and some Gilmore Girls inspired makes for myself. **I am an affiliate for Bella Sunshine Designs and do receive a small commission for each pattern purchased through the link in this post. 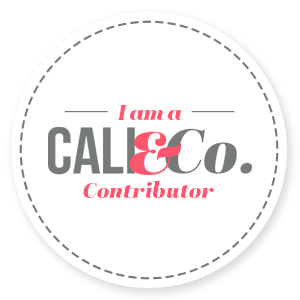 With that being said , I would not be an affiliate if I did not truly believe in the company behind the pattern. 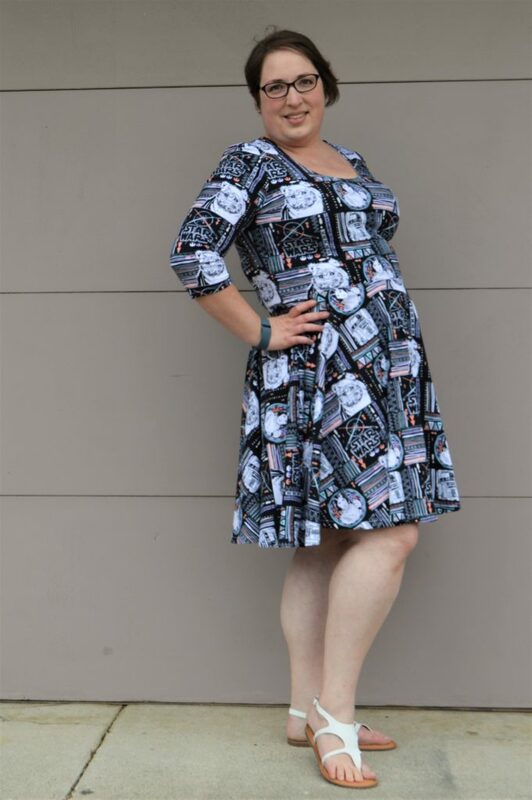 This entry was posted in Sewing and tagged Bella Sunshine Designs, dress, knit, Sahara Dress, Star Wars, Stashbusting Sewalong. Bookmark the permalink. Beautifully sewn! Very flattering on you. That fabric is so fun! It’s good to know that Joann’s is getting some geeky options that aren’t quilt cotton now. I was just thinking today that I should plot a Star Wars inspired outfit for next May 4, since I don’t even have any graphic tees for that fandom and that’s just wrong. It was my first sci fi love, after all. Thanks! I really do love this pattern that you made! I love this- great job! OH! Yay! You are saving me! I’ve been googling all over the place to find a circle skirt in this fabric and I’m here! I was about to cut into my stashed piece for a Halla Patterns twirly girl for PopCon and I thought the pattern might end up sideways (literally). They have the option for a 4 piece cut and I think I’m going to do that. Thank you for your pictures!